After my macaron 'revelation' the other day I was dying to have another go and see if I'd found the final piece in the puzzle. They came out of the oven really crispy again (blagh) but I filled them anyway and left them in the fridge. 24hrs later - beautiful smooth macarons. I'm so pleased, I thought they had me beat! Mr Fiancé also got to finally try a proper macaron and see what all the fuss is about. So this time I followed the David Lebovitz recipe again (except I only made half as much in case they were wrong... again). I left the egg white out while I went into town, so only an hour or two. I whipped the egg whites until it was shiny but not really stiff. I did all that tapping on the counter and waiting for a skin to form stuff then I baked them for 15 minutes with the oven open a bit. I used my favourite chocolate sauce recipe for the filling instead of chocolate ganache then left them in a box in the fridge for 24 hours. In honour of them finally working out they got their pictures taken on my cake stand with the pretty roses. Congrats, I'm glad they finally worked out for you. They look delicious. Thank goodness for that! I like it when they crunch on the outside though... they did that right?? They look delicious! ♥ Congrats! 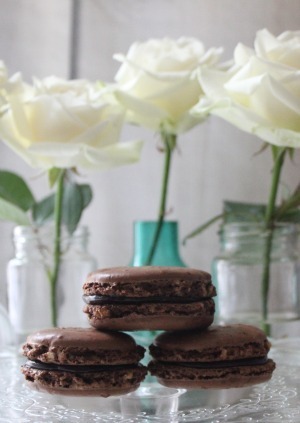 I want to make macarons too, but only have a toaster oven and no whisk... I think I will try anyway ;) Looking at your attempts makes me braver! Those look amazing! Good job! i just found your blog and it filled me with joy! especially since i am currently obsessed with macaroons and i devote this week to them. yours now look amazing! i am a bit jealous! 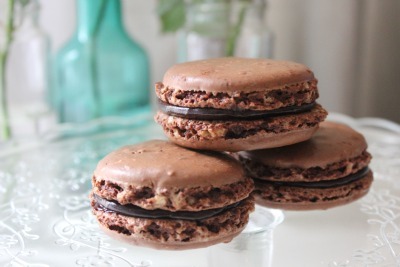 i think my kitchen scales is very crappy so i am getting an electric one, only to make proper macaroons.